Ringing in the new year, Joseph Bellows Gallery has decided to start things with pure Americana, brought to you through the eyes of photographer John Schott. In the summer of 1973, John Schott drove Route 66 from the Midwest to California and back, sleeping in his pick-up truck and photographing with an 8 x 10 inch Deardorf view camera. Among his subjects were the motels situated along this expanse of highway. 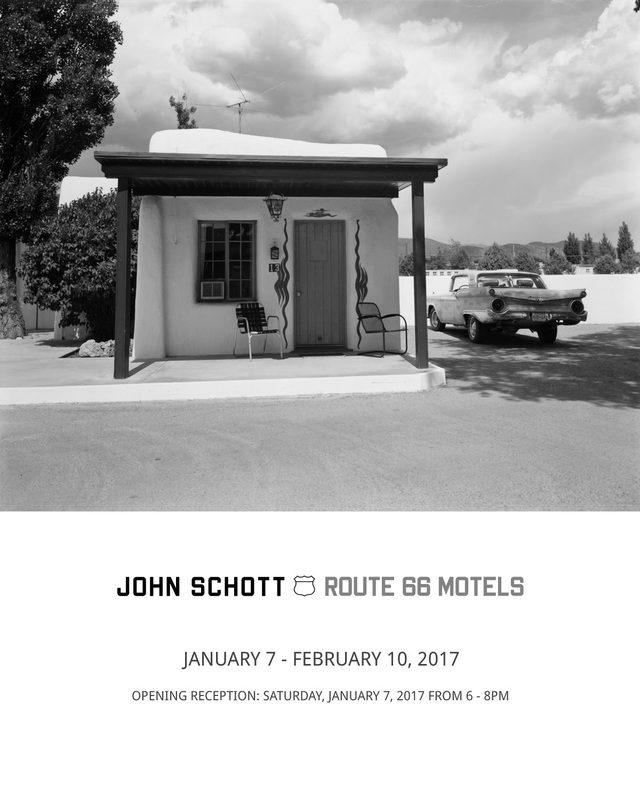 Route 66 Motels will present a key set of vintage prints that formed Schott’s series of topographic views of these small motels that punctuate this highway landscape, both in daylight and under the glow of artificial illumination. In this collection of vernacular forms, Schott describes a particular architectural structure, within a specific era, while subtly reminding his viewers that the road and its adjacent dwellings are part of what defines the landscape. 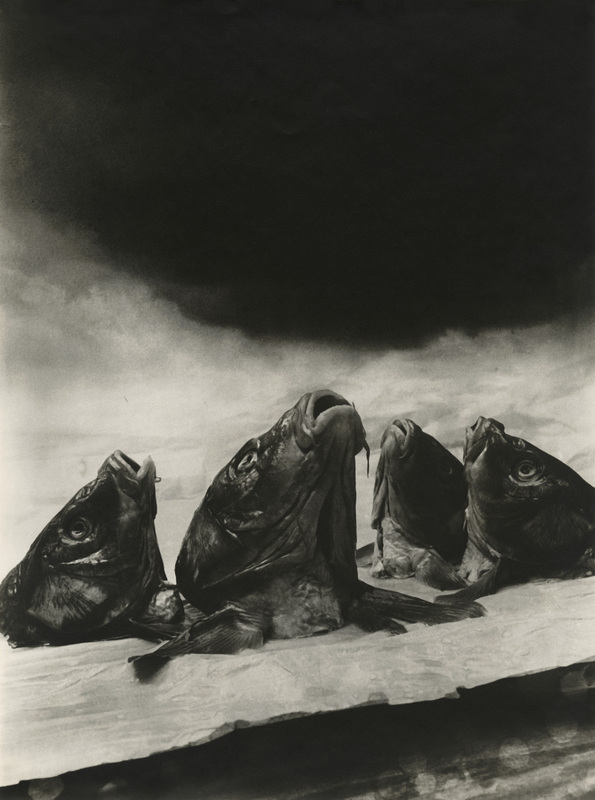 In 1975 he received an Individual Artist’s Fellowship in Photography from the National Endowment for the Arts. That same year he was included in William Jenkins’ seminal exhibition at the George Eastman House, New Topographics: Photographs of a Man-altered Landscape. In 2009 a reexamination of this exhibition organized Britt Salvesen toured to numerous museum venues including: the Center for Creative Photography, Los Angeles County Museum of Art, Jeu de Paume, Paris and Bilbao Fine Arts Museum, Bilbao. “The rich man never really gives anything, he only distributes part of the surplus. It’s the time of celebrating with loved ones and a time for rebirth. It’s also a time for giving to good causes, which donating to the George Eastman museum is in spades. Entrepreneur George Eastman (1854–1932), the pioneer of popular photography, completed his Colonial Revival mansion on East Avenue in Rochester in 1905 and resided there until his death. He bequeathed most of his assets to the University of Rochester, expressing a desire that his mansion serve as the residence for the university president. The large house, measuring 35,000 square feet, proved far too large for this purpose, especially without a large service staff. 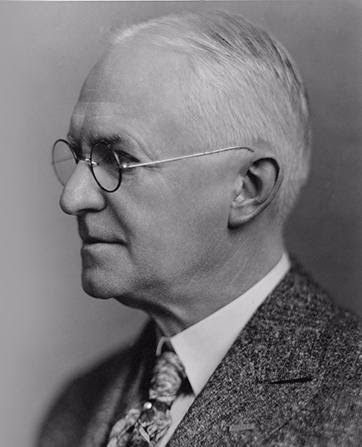 In 1947, the Board of Regents of the State of New York chartered George Eastman House Inc. as an independent nonprofit educational institution—specifically, a museum of photography and allied pursuits created as a memorial to George Eastman. The next year, the University of Rochester donated Eastman’s mansion and surrounding property to the museum. The institution altered its name several times over the ensuing decades, but its mission has remained steadfast: to collect, preserve, study, and exhibit photographic and cinematic objects and related technology from the inception of each medium to the present. At the museum’s opening in 1949, it was one of only two American museums with a photography department and one of only two American museums with a film department (the Museum of Modern Art also had both). In 1951, the museum opened the beautiful Dryden Theatre, with seating for more than five hundred people, to exhibit films. The George Eastman museum is still running strong, but it needs help, just like any non-profit. If you’re a photography lover – if you’re reading this chances are good that you are – consider a donation to the museum today. Well, the weather’s turned frightful, but photographs are never not delightful. John Sexton is taking part in the holiday spirit with a special limited release of his Trees in Snow, inspired by his Darkroom Edition fundraiser 30 years ago. 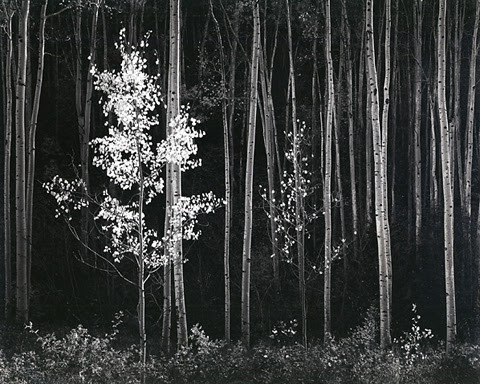 The first limited edition print I released was my image Birch Trunks, New Hampshire. It was offered under the mantle of Darkroom Edition 1986 thirty years ago. The idea behind that limited edition print was to generate funds for the design and construction of our studio darkroom complex in Carmel Valley. Fortunately the edition was a great success, and we are still enjoying the luxury of working in such a fine darkroom, studio, and workshop facility. Much to my surprise I received a number of letters (this was long before emails and eNewsletters!) asking if I would be offering another Darkroom Edition. It had never crossed my mind. Over the years I have offered six previous Darkroom Edition limited edition prints – all of which have sold out. Since 2016 marks the 30th anniversary of the Darkroom Edition series, it seemed like a perfect time to rejuvenate the idea. This image has held a special place in my heart since I made the negative and first printed it a number of years ago. I liked the image so much that I selected it as Plate One in my book Recollections: Three Decades of Photographs. I made this image during a winter trip to my favorite photographic location, Yosemite Valley. The day started out with a heavy overcast that soon lead to a steady snowfall. I made a few negatives as I explored the valley, and the snow kept falling and falling. In early afternoon the clouds suddenly broke and strong, crisp low-angle sunlight raked across El Capitan Meadow. The light moved quickly so I had to respond in kind. Using the 150 mm lens on my 4×5 Linhof Technika camera I made an exposure of 1/2 second at f/45. 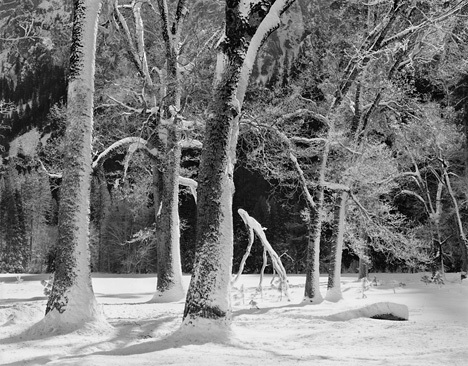 The high contrast between the intense sunlight on the bright snow and the deep shadows in the background forest necessitated N-1 reduced development, a technique to allow the negative to accommodate such a high contrast situation. It is an understatement to say that this negative is difficult to print. Dodging takes place during the entire basic exposure with both hands. This is followed by extensive burning in, as well as localized print flashing, a technique to add detail in extremely bright areas. While the printing techniques are challenging, the excitement one gets when turning on the white lights in the darkroom and seeing a print that is “just right” makes it all worthwhile. These 11 x 14″ silver gelatin prints will be offered in a limited edition of 100 signed and numbered prints along with ten Artist’s Proofs. There will be no reprints. For this special edition, Sexton has reduced the price of the print by 20%. Prints are already shipping, so if you feel the need, act now. While America and France have long had their ups and downs, not a single US citizen can deny that the French have long had style and a profound love of the arts. Christian Bouqueret, who passed in 2013, was a prominent French art historian, curator and collector. His collection of vintage photography is truly a sight to behold, which is exactly what inspired Gitterman Gallery with its latest exhibit. Tom Gitterman considered Bouqueret to be a mentor and friend, which will make this exhibit particularly significant to the gallery. Christian Bouqueret became interested in the modernity of Bauhaus photography during his art history studies in Berlin. Bouqueret was co-director of Bouqueret-Lebon Gallery from 1990-1997, which represented both contemporary German and French photography. He published many catalogs during his lifetime, including Assia sublime modèle, Les Femme Photographes, and books on Daniel Masclet, Jean Moral, Roger Parry, André Steiner, Raoul Ubac, and René Zuber. Bouqueret’s seminal 1997 book, Des années folles aux années noires: La nouvelle vision photographique en France 1920-1940, which presented over seventy photographers from the period, won the Prix Nadar photography book award. Bouqueret curated 200 vintage prints from his collection for the 2009 Jeu de Paume exhibition entitled Paris capitale photographique 1920-1940: Collection Christian Bouqueret. In 2011 the Pompidou Centre acquired nearly 7,000 photographs from Bouqueret’s collection, which was considered one of the best privately-owned Modernist photography collections in France. The following year the Pompidou exhibited a selection of the collection and published an accompanying catalog titled Voici Paris: Modernités Photographiques, 1920-1950. As Andy Grunberg writes in the Jeu de Paume catalog: “what we know of the history of photography is a result or sum of what has been preserved, collected, exhibited and published.” Thanks to Christian Bouqueret, that history is richer. The “Hommage” is now available for viewing and will run until January 21st, 2017. Prison photographs, or mug shots, hold a unique place in portrait photography. While many portraits are taken and published with the permission of the subject – and often highlight a person in a presentable state – there’s no choice for the subject in prison. Is a mug shot representative of someone in their most candid state? If not, it’s a least a prime low point for any individual. CameraWork gallery will be delving into the medium with their latest exhibit: Mug Shots from the collection of Nick Petula, curated by Bernie Andreoli. The spark for this show began three years ago when my friend Nick Petula asked me to scan part of his collection of 100-year-old Scranton Police Department mug shots. They intrigued me. I couldn’t get the images, descriptions of the criminals and description of crimes out of my head. The images are wonderful examples of basic informational portraits yet they appear to have been made by a true photographic artist. The frontal image with an expressionless stare and piercing eyes and the casual profile belie the reason for the images to be made. A meld of art, history and the foibles of man. The exhibit will conclude December 30th. For much of the country, North Dakota is known for little besides good hockey, Carson Wentz, oil and a certain Coen Brothers film. But now, for photography buffs, Photo Review founder Stephen Perloff’s latest series should add to the list of North Dakota familiarity. The exhibit will come to a close November 30th.